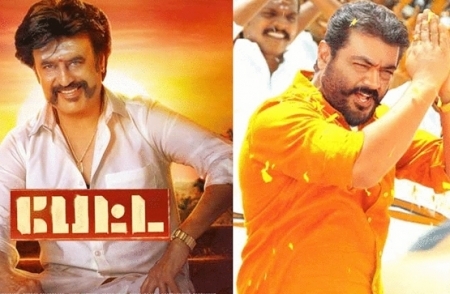 It was war of words between fans of Rajinikanth and Ajith fans in social media ever since Viswasam trailer got released on Sunday. Wonder why the war was? It dates back to a month ever since the makers of Rajini's Petta announced that they will hit the screens for Pongal. Viswasam was already lined up for January release. Cut to Viswasam trailer. There is a furious AJith saying. 'My name is Thooku Durai. I come from Theni district. My wife’s name is Niranjana and my daughter’s name is Swetha. If ready come face-to-face'. Petta is bankrolled by Sun Pictures and directed by Karthik Subbaraj. The movie stars Simran, Trisha Vijay Sethupathi, Nawazuddin Siddiqui and Bobby Simha in lead roles. Music is by Anirudh. Viswasam is directed by Siva and featireds Nayanthara as heroine. Jagapathy Babu plays villain. Music is by Imman.